The Hershey Company (NYSE: HSY) today announced sales and earnings for the third quarter ended October 2, 2016. Consolidated net sales were $2,003.5 million compared with $1,960.8 million for the third quarter of 2015. Reported net income for the third quarter of 2016 was $227.4 million or $1.06 per share-diluted, compared with $154.8 million or $0.70 per share-diluted for the comparable period of 2015. As described in the Note below, for the third quarter of 2016, these results, prepared in accordance with U.S. generally accepted accounting principles (GAAP), included items impacting comparability of $72.4 million, or $0.23 per share-diluted. Reported gross margin of 42.5% represented a decrease of 300 basis points versus the third quarter of 2015, while reported operating profit increased 23.4% to $374.0 million. For the third quarter of 2015, items impacting comparability totaled $140.2 million, or $0.47 per share-diluted. As described in the Note, adjusted net income, which excludes these items, was $277.3 million, or $1.29 per share-diluted, for the third quarter of 2016, compared with $257.2 million, or $1.17 per share-diluted, for the same period of 2015. For the first nine months of 2016, consolidated net sales were $5,469.9 million compared with $5,477.4 million for the same period of 2015, a decrease of 0.1%. Reported net income for the first nine months of 2016 was $603.2 million or $2.80 per share-diluted, compared with a $299.6 million or $1.35 per share-diluted for the comparable period of 2015. For the first nine months of 2016 and 2015, these results, prepared in accordance with GAAP, included items impacting comparability of $133.1 million and $421.8 million, or $0.44 and $1.69 per share-diluted, respectively. Adjusted net income, which excludes these items, was $698.9 million, or $3.24 per share-diluted, for the first nine months of 2016, compared with $672.7 million, or $3.04 per share-diluted, for the same period of 2015, an increase of 6.6% in adjusted earnings per share-diluted. In 2016, the company expects reported earnings per share-diluted of $3.82 to $3.90, including items impacting comparability of approximately $0.42 to $0.46 per share-diluted. This projection, prepared in accordance with GAAP, assumes business realignment charges of $0.45 to $0.47 per share-diluted, non-service related pension expense (NSRPE) of $0.07 to $0.08 per share-diluted, net acquisition integration costs of $0.02 to $0.03 per share-diluted and a favorable settlement of the Shanghai Golden Monkey (SGM) liability of $0.12 per share-diluted. Consolidated net sales were $2,003.5 million in the third quarter of 2016, an increase of 2.2% versus the third quarter of 2015. Excluding the effect of foreign currency translation, a 0.2 point headwind, net sales increased 2.4% versus the year ago period. Volume was a 1.0 point contribution and in line with estimates. Net price realization was 0.7 points favorable as direct trade and returns, discounts and allowances in the International and Other segment were less than last year. Acquisitions were a 0.7 point benefit in the third quarter. Adjusted gross margin was 45.6% in the third quarter of 2016, compared to 46.0% in the third quarter of 2015. The 40 basis point decline was driven by unfavorable mix and other supply chain costs, partially offset by supply chain productivity and costs savings initiatives. As expected, total advertising and related consumer marketing expense was lower in the third quarter of 2016. For the full year, the combined investments of advertising and related consumer marketing expense, as well as direct trade in North America, are expected to increase, supporting new product launches and in-store merchandising and display activity. Selling, marketing and administrative (SM&A) expenses, excluding advertising and related consumer marketing and the barkTHINS acquisition, declined about 2% in the quarter, as higher employee-related costs were more than offset by productivity and cost savings programs. As a result, consolidated adjusted operating profit of $446.4 million in the third quarter of 2016 increased 7.6% versus the third quarter of 2015. The third-quarter tax rate decline versus the prior year period was greater than anticipated, largely as a result of favorable tax outcomes related to R&D tax credits. For the full year, the company estimates that the tax rate will be lower than last year by about 100 basis points versus a previous estimate of a 50 basis point decline. For the first nine months of 2016, the company repurchased $420 million of outstanding shares, resulting in diluted shares outstanding of 215.2 million at the end of the third quarter of 2016, compared to 220.1 million for the same period of 2015. “Our priorities for the year remain unchanged and we’re focused on delivering on the objectives we outlined earlier this year,” Bilbrey continued. “We’re making the necessary investments we believe will strengthen Hershey’s leadership position and build upon our latest marketplace results. 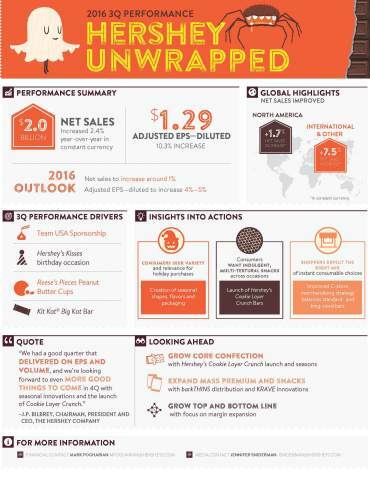 Our seasonal business and programs are on track and the launch of Hershey’s Cookie Layer Crunch bar should enable us to end the year with momentum,” Bilbrey concluded. The company estimates that full-year 2016 net sales will increase around 1.0%, including a net benefit from acquisitions and divestitures of about 0.5 points. The impact of unfavorable foreign currency exchange rates is expected to be about 0.75 points versus the previous estimate of around 1 point. Additionally, the company continues to expect gross margin to be slightly below last year due primarily to unfavorable sales mix. Business productivity and cost savings programs are on track with our targets and the tax rate is expected to be slightly favorable versus our previous expectations. As a result, the company expects adjusted earnings per share-diluted for 2016 to increase 4% to 5%, including barkTHINS dilution of $0.05 to $0.06 per share, and be in the $4.28 to $4.32 range versus a previous estimate of $4.24 to $4.28. The following are comments about segment performance for the third quarter of 2016 versus the year ago period. See the attached schedule of supplementary information for additional information on segment net sales and profit. Hershey’s North America net sales were $1,764.5 million in the third quarter of 2016, an increase of 1.8% versus the same period last year. Volume was a 1.1 point contribution to sales growth and net price realization a 0.1 point headwind. The barkTHINS acquisition was a 0.8 point benefit in the third quarter of 2016. Total Hershey U.S. retail takeaway1 for the 12 weeks ended October 8, 2016, in the expanded all outlet combined plus convenience store channels (xAOC+C-store) increased 0.6%. For the 12 weeks ended October 8, 2016, Hershey’s U.S. CMG market share was 31.0%, the same as the year ago period. North America segment income increased 3.3% to $563.9 million in the third quarter of 2016, compared to $546.1 million in the third quarter of 2015. The increase in segment income was driven by an increase in gross profit of about 1.0% and lower advertising and related consumer marketing expense. Third-quarter net sales for Hershey’s International and Other segment increased 5.3% to $238.9 million. Net price realization was a 7.4 point benefit as direct trade and returns, discounts and allowances in China were less than the same period last year. Volume was a 0.1 point contribution to net sales and unfavorable foreign currency exchange rates were a 2.2 point headwind. Combined third-quarter constant currency net sales in Mexico and Brazil increased nearly 18% driven by solid Hershey's marketplace performance. China gross sales declined in line with expectations due to the challenging macroeconomic and competitive environment. In the third quarter of 2016, China chocolate category retail sales declined about 4.0%. International and Other segment income of $4.3 million compares to a segment loss of $13.5 million in the third quarter of 2015. Combined income in Latin America and export markets improved versus the prior year and performance in China benefited from lower returns, discounts and allowances and direct trade. Hershey's unallocated adjusted corporate expense in the third quarter of 2016 was $121.8 million, an increase of $4.1 million versus last year. Savings from the previously mentioned productivity and cost savings initiatives were more than offset by higher employee-related costs and other corporate fees. At 8:30 a.m. ET today, Hershey will host a conference call to elaborate on third-quarter results. To access this call as a webcast, please go to Hershey’s web site at http://www.thehersheycompany.com. Note: In this release, Hershey references income measures that are not in accordance with GAAP because they exclude business realignment activities, goodwill impairment charges, acquisition integration costs, settlement of the SGM liability, the gain realized on the sale of a trademark, costs associated with the early extinguishment of debt, NSRPE and gains and losses associated with mark-to-market commodity derivatives. These non-GAAP financial measures are used in evaluating results of operations for internal purposes. These non-GAAP measures are not intended to replace the presentation of financial results in accordance with GAAP. Rather, the company believes exclusion of such items provides additional information to investors to facilitate the comparison of past and present operations. A reconciliation of the non-GAAP financial measures referenced in this release to their nearest comparable GAAP financial measures as presented in the Consolidated Statements of Income is provided below. * The tax impact is determined by multiplying each pre-tax reconciling adjustment by the applicable statutory income tax rates, taking into consideration the impact of valuation allowances, as applicable. (1) Calculated as non-GAAP gross profit as a percentage of net sales for each period presented. (2) Calculated as non-GAAP operating profit as a percentage of net sales for each period presented. (3) Calculated as non-GAAP provision for income taxes as a percentage of non-GAAP income before taxes (calculated as non-GAAP operating profit minus non-GAAP interest expense, net plus or minus non-GAAP other (income) expense, net). We present certain percentage changes in net sales on a constant currency basis, which excludes the impact of foreign currency exchange. To present this information for historical periods, current period net sales for entities reporting in other than the U.S. dollar are translated into U.S. dollars at the average monthly exchange rates in effect during the corresponding period of the prior fiscal year, rather than at the actual average monthly exchange rates in effect during the current period of the current fiscal year. As a result, the foreign currency impact is equal to the current year results in local currencies multiplied by the change in average foreign currency exchange rate between the current fiscal period and the corresponding period of the prior fiscal year. We also present the percentage change in projected 2016 net sales on a constant currency basis. To determine this, projected 2016 net sales for entities reporting in currencies other than the U.S. dollar are translated into U.S. dollars at the company's average monthly exchange rates in effect during the corresponding period of the prior fiscal year, and are compared to the 2015 results translated into U.S. dollars using the same 2015 average monthly exchange rates. Our 2016 projected earnings per share-diluted, as presented above, does not include the impact of mark-to-market gains and losses on our commodity derivative contracts that will be reflected within corporate unallocated expenses in our segment results until the related inventory is sold, under our revised accounting policy for commodity derivatives. Mark-to-Market Losses on Commodity Derivatives: Commensurate with our discontinuance of hedge accounting treatment for commodity derivatives, we are adjusting the mark-to-market losses on such commodity derivatives, until such time as the related inventory is sold. Since we often purchase commodity contracts to price inventory requirements in future years, we make this adjustment to facilitate the year-over-year comparison of cost of sales on a basis that reflects the derivative gains and losses with the underlying economic exposure being hedged for the period. Business Realignment Activities: We periodically undertake restructuring and cost reduction activities as part of ongoing efforts to enhance long-term profitability. During the second quarter of 2016, we commenced a program to optimize our production and supply chain network, which will result in select facility consolidations. The program encompasses the continued transition of our China chocolate and SGM operations into a united Golden Hershey platform, including the integration of the China sales force, which began in the first quarter, as well as the consolidation of production within certain facilities in China and North America. Business realignment charges incurred in the three- and nine-month periods of 2016 relate primarily to non-cash accelerated depreciation expense, severance expense, and other third-party advisory costs relating to this program, in addition to pension settlement charges driven by individuals who departed under the 2015 productivity initiative receiving lump-sum pension distributions. Business realignment charges incurred in the three- and nine-month periods of 2015 primarily represent employee severance and related separation benefits as well as incremental third-party costs related to the design and implementation of the new organizational structure. Acquisition Integration Costs: We have incurred costs related to the integration of the 2016 acquisition of Ripple Brand Collective, LLC as we incorporate this business into our operating practices and information systems. During 2015, we incurred costs related to the 2014 acquisitions of SGM and Allan Candy and the 2015 acquisition of Krave. Non-Service Related Pension Expense: Non-service related pension expense (NSRPE) includes interest costs, the expected return on pension plan assets, the amortization of actuarial gains and losses, and certain curtailment and settlement losses or credits. The NSRPE can fluctuate from year-to-year as a result of changes in market interest rates and market returns on pension plan assets. We believe that the service cost component of our total pension benefit costs closely reflects the operating costs of our business and provides for a better comparison of our operating results from year-to-year. Therefore, we exclude the NSRPE from our internal performance measures. Our most significant defined benefit pension plans were closed to most new participants in 2007, resulting in ongoing service costs that are stable and predictable. The NSRPE for the three- and nine-month periods ended October 2, 2016 included $1.3 million and $5.6 million in settlement charges, respectively. Settlement of SGM Liability: In the fourth quarter of 2015, we reached an agreement with the SGM selling shareholders to reduce the originally-agreed purchase price for the remaining 20% of SGM, and we completed the purchase on February 3, 2016. In the first quarter of 2016, we recorded a $26.7 million gain relating to the settlement of the SGM liability, representing the net carrying amount of the recorded liability in excess of the cash paid to settle the obligation for the remaining 20% of the outstanding shares. Goodwill Impairment: As disclosed in 2015, we recorded a non-cash impairment charge representing a write-down of all of the goodwill related to the SGM reporting unit. In the third quarter of 2015, we finalized the assessment of the goodwill generated by the SGM acquisition, resulting in additional goodwill impairment charges. Loss on Early Extinguishment of Debt: During the third quarter of 2015, we recorded a loss on the early extinguishment of debt relating to a cash tender offer. Gain on Sale of Trademark: During the first quarter of 2015, we recorded a gain related to the sale of a non-core trademark. This release contains forward-looking statements within the meaning of the Private Securities Litigation Reform Act of 1995. Many of these forward-looking statements can be identified by the use of words such as “intend,” “believe,” “expect,” “anticipate,” “should,” “planned,” “projected,” “estimated,” and “potential,” among others. These statements are made based upon current expectations that are subject to risk and uncertainty. Because actual results may differ materially from those contained in the forward-looking statements, you should not place undue reliance on the forward-looking statements when deciding whether to buy, sell or hold the company's securities. Factors that could cause results to differ materially include, but are not limited to: issues or concerns related to the quality and safety of our products, ingredients or packaging; changes in raw material and other costs, along with the availability of adequate supplies of raw materials; selling price increases, including volume declines associated with pricing elasticity; market demand for our new and existing products; increased marketplace competition; disruption to our manufacturing operations or supply chain; failure to successfully execute and integrate acquisitions, divestitures and joint ventures; changes in governmental laws and regulations, including taxes; political, economic, and/or financial market conditions; risks and uncertainties related to our international operations; disruptions, failures or security breaches of our information technology infrastructure; our ability to hire, engage and retain a talented global workforce; and such other matters as discussed in our Annual Report on Form 10-K for the year ended December 31, 2015. All information in this press release is as of October 28, 2016. The company undertakes no duty to update any forward-looking statement to conform the statement to actual results or changes in the company's expectations. (1) Includes centrally-managed (a) corporate functional costs relating to legal, treasury, finance, and human resources, (b) expenses associated with the oversight and administration of our global operations, including warehousing, distribution and manufacturing, information systems and global shared services, (c) non-cash stock-based compensation expense, and (d) other gains or losses that are not integral to segment performance. (2) Includes gains and losses on commodity derivative instruments which have been excluded from segment income until the related inventory is sold.